The Precedence knob takes precedence. 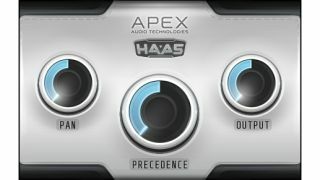 Apex Audio has released Haa5, a new plugin that uses psycho-acoustic delay lines to offer what its developers claim is precise control over the stereo image. As its name implies, Haa5 is based on the precedence or Haas effect, which was described by Helmut Haas in 1949. Apex Audio explains: "The Haas effect creates a sense of direction by using the same system our own ears use to locate sounds in the natural world. By creating a slight delay between the left and right signals the listener perceives a sense of direction depending on which ear hears the signal first. So, if the right signal is delayed, then the left ear will pick up the sound first, causing the sound to seem to come from the left; and vice versa." Haa5 promises more precise stereo control than simple panning, yet comes with a straightforward control set. You can download it for free in VST/AU formats for Mac and PC from the Apex Audio website.